Director/Screenplay – Kellie Madison, Producers – Tove Christensen, Georgy Malkov, Steven Schneider & Michael Wexler, Photography – Greg Gardiner, Music – Timothy Williams, Visual Effects – Big Sky Laboratories (Supervisor – Matt Hartle), Production Design – Eve McCarney. Production Company – A Tove Christensen-Michael Wexler Production/Maple Leaf, LLC/Open Road Films. An enquiry is held to determine the reasons why Ice-Sat 5, an experimental NASA habitat built in the Antarctic and designed to simulate conditions on Mars, ended in disaster with most of the personnel killed. Back in 2012, NASA proudly announced the project and the six-person crew under Commander Will Sacks were sealed into the habitat for the next twelve months. As comes out in the enquiry, the project was hurried into being operation before the budget appropriation expired, which meant that corners had been cut when it came to safety protocols and psychological testing of the crew. As became apparent some months into the project, tensions developed within the crew, while the obsessions of crewman Luke Millens grew into full-blown mental instability. This was one of several films produced by Star Wars prequel actor Hayden Christensen and his brother Tove who were also behind the likes of Cooties (2014) and Lady of Csejte (2015). It was a directorial debut for Kellie Madison who had previously made several short films, as well as having written the screenplay and produced the true crime film Dear Mr. Gacy (2010). The Tank can be very marginally considered a science-fiction film – it is set around a NASA habitat experiment designed for future Mars habitation – something like this has not happened in real life so far, although it could very easily do so meaning that it does not exactly involve the speculative science that science-fiction is based around but falls within the realm of possibility. We have had films about habitats before with Bio-Dome (1996), which had a comedic focus and a level of inanity that is at about as completely opposite a remove from the psychological drama of The Tank as it is possible to get. 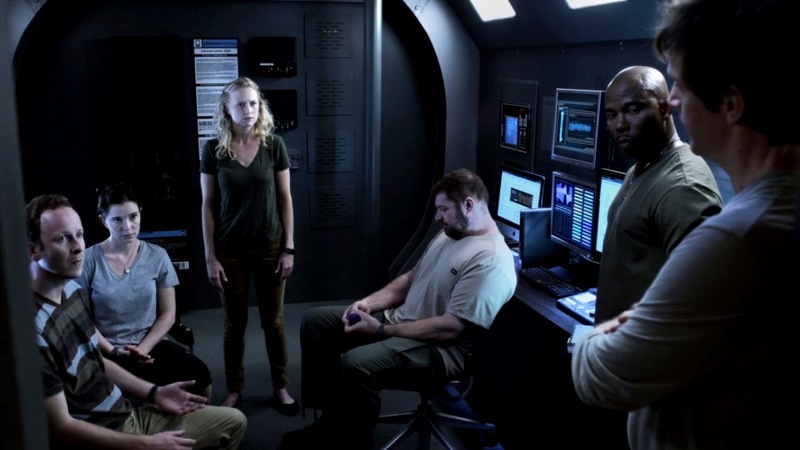 Kellie Madison has simply give us a containment thriller – in placing a bunch of characters inside a confined environment, contriving a situation to keep them there and winding the dramatics up until they arrive at an explosive confrontation/emergency during which several people are killed. The dramatics are okay but there is nothing that holds you gripped on the edge of the seat or riveted with unexpected turns – just a group of characters in conflict. Madison has a C-list cast at her disposal, most of whom are all perfectly convincing in their various roles. As the disturbed member of the crew, Erik King fairly much plays exactly the same bug-eyed crazy that he did on tv’s Dexter (2006-13).